cost Costs are dependent on what activity you're interested in. 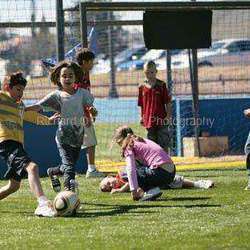 Welcome to the home of Azzurri, a fun park for the entire family, situated at the Italian Club, in the heart of Bedfordview. We love the sound of happiness and focus on ensuring that both adults and children enjoy their time with us. Go poke around our website and read about our indoor soccer fun, as well as our fun park that will keep your children entertained with trampolines, zip lines and a lot more. We offer a full-service party venue to kids of all ages at an affordable price, so feel free to contact us with any of your requirements. Enjoy what we have to offer. Enjoy life! Azzurri Fun Park offers you a safe and secure, outdoor, entertaining party venue that suits most party requirements as well as your budget. Our facility has all the necessary safety regulations in place, from engineering permits through to helmets and fully trained, friendly staff. Azzurri Fun Park offers you a safe and secure, outdoor, entertaining venue that is suitable for children from 3 years old. Not only do we specialise in kid’s parties, but the venue boasts a variety of entertainment i.e. trampolines, ziplines, bubble soccer, hoverboards, jumping castles, water warfare (water balloons and water guns), henna tattoos, basket hoops, face painting, photo booths etc. - Our facility has all the necessary safety regulations in place, from engineering permits through to helmets and fully trained, friendly staff. - Children are encouraged to take part in a bunch of different activities while parents get to enjoy an Italian blend cappuccino. - Our café offers light snacks, much loved pizza and a range of coffees, cold drinks and a fully licensed bar. - Our fun park is fully function on Saturdays ONLY. You have the option of joining us for either a morning session or an afternoon session. Morning 09:00 – 12:00 or Afternoon 13:00 – 16:00. Entrance fee: R150 per session. Not sure what to do with your children during the school holidays? You’re not alone! Join us every holiday for three days of fabulous outdoor activity, old fashioned games and physically challenging obstacle courses. 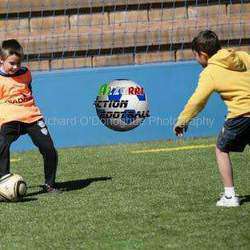 Get your kids outside, away from those screens and gadgets and allow them to make new friends, develop their ball skills and growth through fun, engaging play. Our indoor soccer league plays Monday – Thursday evenings and Sunday mornings, and is open to teams of all sexes and ages. Our soccer facilities include an astro-turf arena 20m x 40m, enclosed with 3 foot walls and netting. We have two leagues – social and super league – you pick the league that best suits you and your team. Teams are made up of six players with a maximum of four reserves. The game lasts for a total of forty minutes broken into two, twenty minute sessions. There is a certain amount of sense of humour required to participate in Bubble Soccer! Here you get strapped into an inflated ball that ranges from 1.5 – 1.9 meters in diameter (depending on your size). The players body is completely enclosed (don’t worry, there is space to breathe) with only their legs let loose to run around. A huge amount of fun, a great workout and plenty to speak about after the game, is guaranteed. A normal game of soccer is then played with six a side, a certain amount of bumping, rolling and laughing is involved and some rules that ensure safety for all. Bubble Soccer is very safe, you won’t need to worry about any injuries (well, any more than a normal game of soccer). 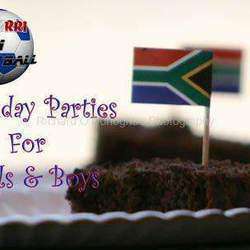 Games are played Monday – Sunday and a fine option for birthday parties and corporate team building. Team building is pertinent to encouraging a sense of belonging, morale and growth. We love seeing teams go up against each other during the game and then come together over fresh pizza and a cold beer! Our prize-winning team building exercise is Bubble Soccer. It is fun, safe and brings out the true colours of the people that you work with. It is suitable for all ages and is guaranteed fun.